As I mentioned on Thursday, a bill was introduced at the Board of Aldermen on Friday the 12th regarding confederate monuments. flags, etc. I’m in the minority view the revisionist history moment in Forest Park should remain. Why, you ask? St. Louis and Missouri has an ugly history regarding race — before and after the Civil War. The region has ever fully come to accept the many wrongs committed in the past…and present. If I could I’d build more in Forest Park to help explain the full picture — good & bad. I can’t do that, but I can do so here. Slavery was a central fact of life in this region — even some early missionary priests owned slaves. When young Auguste Chouteau directed land clearing for the village in 1764, slaves probably were in his workforce. The first baptisms here included children of Indian slave women. 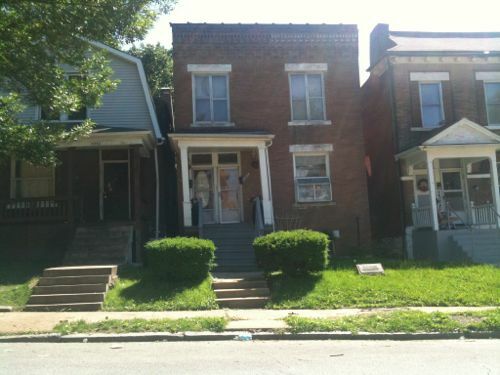 Chouteau Ave is named for St. Louis’ pro-slavery founder, Auguste Chouteau. The area South of downtown is called Chouteau’s Landing. Over the years there has been talk of recreating a lake where railroad tracks now exist — to be called — Chouteau’s Pond. St. Louis really likes this proponent of slavey! Life for slaves in urban areas was different than stereotypical life on plantations, and created a unique set of circumstances which, for some, enabled the possibility of escaping slavery in the various ways detailed in these lists.St. Louis was a cosmopolitan river town, and its port was the third busiest in the nation. A mix of whites, slaves, free persons of color, and immigrants filled St. Louis with diverse people and opinions. In 1850, when Dred and Harriet Scott were suing for their freedom, St. Louis was a rapidly-growing city of over 80,000 residents, including 2,656 slaves and 1,398 free persons of color. African Americans were a part of this St. Louis milieu from the time of its first European settlement in 1764. Several prominent early residents were free blacks who were landowners and craftsmen. When the United States assumed political control of St. Louis in 1804, life changed for slaves who had lived under the French and Spanish systems. So-called “black laws” were written which added far more restrictive regulations to slave life. The State of Missouri was admitted to the Union in 1821 amid controversy over the insistence of the St. Louis power elite that it would join the Union as a slave state; only the Missouri Compromise of 1820, which included the admission of the free state of Maine to maintain a balance of power in the U.S. Senate, averted a national crisis. Today we think of St. Louis as a blue oasis on the edge of a red state, most were pro-slavery before statehood. Before Missouri was a US state the territory was controlled by St Louis interests. These St. Louis interests wanted Missouri to be a pro-slavery state. The Missouri Compromise allowed Missouri to enter the union as a slave state. Around 1835 Benton slowly began to change his views. While he did not view slavery as wrong or wish to abolish it completely, he did not want to see it spread into the territories. Gov Jackson wanted Missouri to secede. After Lincoln’s election, Jackson, despite having presented himself during the campaign as a supporter of the Union, immediately pushed for secession. In his inaugural speech as governor, he made clear his determination to support the South. The Civil War ended in 1865, but life for African-Americans in St. Louis remained highly segregated. In 1878, grain executive and former Confederate cavalryman Charles Slayback called a meeting of local business and civic leaders. His intention was to form a secret society that would blend the pomp and ritual of a New Orleans Mardi Gras with the symbolism used by the Irish poet Thomas Moore. From Moore’s poetry, Slayback and the St. Louis elite created the myth of the Veiled Prophet of Khorassan, a mystic traveller who inexplicably decided to make St. Louis his base of operations. Perhaps more fundamentally though, the VP activities were a response to growing labor unrest in the city, much of it involving cooperation between white and black workers. A year before the founding of the Order of the Veiled Prophet was the Great Railroad Strike of 1877, in which railroad workers across the country brought cars to halt in protest of abominable pay and working conditions. In St. Louis, nearly 1,500 striking workers, both black and white, brought all rail freight to a standstill for an entire week. The involvement of the St. Louis Workingman’s Party eventually expanded the demands of the protest to include things like a ban on child labor and an eight-hour workday. Of course, this was untenable to the municipal and national powers. The strike ended when 5,000 recently deputized “special police” aided federal troops in forcing the strikers to disperse. Eighteen strikers were killed. The strike ended nationally within 45 days. The Confederate monument in Forest Park was erected in 1914 — during a period of continued racial tensions in St. Louis and in other cities. The next year a young Harland Bartholomew was convinced by Luther Ely Smith to move to St, Louis and become its first planner. The city of Louisville had an ordinance that forbade any black individuals to own or occupy any buildings in an area in which a greater number of white persons resided and vice versa. In 1915, William Warley, a prospective black buyer, made an offer to Charles H. Buchanan for his property in a predominately white neighborhood. Buchanan v.Warley was heard by the US Supreme Court in April 1916 — St. Louis was busy with efforts to remain segregated. The Confederate monument in Forest Park was built during this period, a time when many rural/Southern blacks were moving to Northern cities looking for work. The civil rights era was still decades away. In 1917, East St. Louis was crowded with factories. Jobs were abundant. But as World War I halted the flow of immigration from Eastern Europe, factory recruiters started looking toward the American South for black workers. Thousands came, and as competition for jobs increased, a labor issue became a racial one. East St. Louis’ angry white workers found sympathy from the leaders of the local Democratic party, who feared that the influx of black, mostly Republican voters threatened their electoral dominance. In one particularly striking parallel to today’s political landscape, local newspapers warned of voter fraud, alleging that black voters were moving between northern cities to swing local elections as part of a far-reaching conspiracy called “colonization,” according to the documentary series Living in St. Louis. That May, a local aluminum plant brought in black workers to replace striking white ones. Soon, crowds of whites gathered downtown, at first protesting the migration, then beating blacks and destroying property. On July 1, a group of white men drove through a black neighborhood, firing a gun out their car window. (The perpetrators were never caught.) A few hours later, another car drove through the neighborhood. Black residents fired at it, killing two police officers. Are racially based restrictive covenants legal under the Fourteenth Amendment of the United States Constitution? To the first question the Supreme Court said yes, they were legal. But, in #2 they ruled the courts couldn’t enforce them 00 doing so would be unconstitutional. There’s so much more, but frankly I’m tired of writing about it..for now. St. Louis has never accepted the ugly past so we can’t move forward. Removing part of the history it needs to understand and accept is the wrong direction to go — so it’ll likely happen. People will be congratulated, Future generations won’t know the truth.